The Lineberger family of North Carolina’s Gaston County became one of the leading donors to the library and the medical school. Their fortune came from the state’s textile industry. The first Lineberger textile mill appeared in 1835, but the business did not significantly expand until the early twentieth century when Abel Caleb Lineberger (1857-1947) specialized in spinning combed yarn, a finer grade popular in high-end goods. At one time, the Lineberger family owned twenty combed yarn mills. Many members of the family attended the university, including J. Harold Lineberger (class of 1926) and Joseph W. Lineberger (class of 1933). The family formed a foundation in 1944 that dispensed gifts to the university, and in 1984, Carolina completed the Lineberger Cancer Research Center. 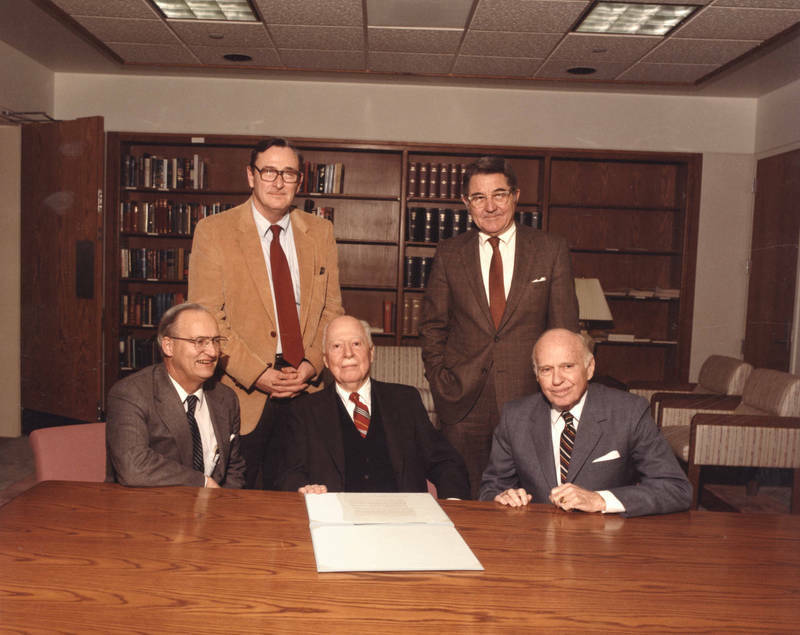 J. Harold and Joseph Lineberger posed with Christopher Fordham (seated left), James Govan (standing left) and William C. Friday (standing right) on March 1, 1984, to celebrate the occasion.